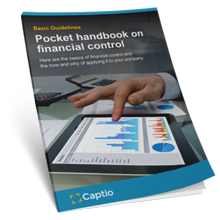 Financial control lets you know the status of a company at every moment. It is like taking a picture in high definition to see the exact status of your company or business in terms of treasury, profitability, cash flow and other important parameters. Analysis of the initial situation and definition of objectives. Establishment of the parameters or standards. Measurement and analysis of the deviations from the basic financial statements. We will send it to you by e-mail so that you can read it now or whenever you like. We hope you that you find it interesting! "Captio has given us greater efficiency and simplicity, allowing us to digitize the process." © 2016 Captio. All rights reserved.